Promote a culture of continuous learning in your Chamber. The ACE program is open to all CCEC members. There are 3 levels depending on your experience and scope of activities undertaken. Level 1 requires two years of experience and is attainable by smaller Chambers with limited budgets. Levels 2 and 3 require four and eight years of experience, respectively, and a higher level of participation in professional development and leadership activities. For provincial Chamber CEO, reference from national Chamber required. See the ACE Application Guidelines for guidance on completing your application. Applications are accepted up to May 31. 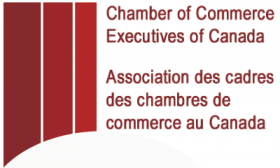 Accredited Chamber Executives will be recognized at the CCEC conference in September.